This cabinet is designed to honor veterans and other service workers upon retirement or death. Display a folded 5' x 9-1/2' American flag, service medals, emblems or photographs. Flag folding instructions included. Hangs on a wall or sits on a shelf or fireplace mantle. Can be built with or without hat display. Measures 23"H x 20"W x 5"D. Plans drawn FULL SIZE. 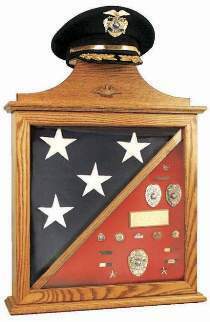 Order #1040 Flag Display Case Hardware package and #5962 Oak Eagle separately. The #1040 Hardware package contains one pair of non-mortise hinges with mounting screws, knob and magnetic catch. Or SAVE by ordering the #1061 Flag Display Case Special which includes #W2040 Plan, #1040 Hardware package and #5962 Eagle.